in the new Elephant Care Center’s recreation room. The Milwaukee County Zoo is proud to announce its new Elephant Exhibit, transforming one-fourth of the Zoo’s current layout, will officially open to visitors Saturday, May 4, with a “grand reveal” and opening day activities at 10 a.m. Outdoor habitat and feeding wall on left; push poles in middle area of the habitat. The new 20,000-square-foot Elephant Care Center features a recreation room with both sand and padded floors, five individual stalls for training and husbandry (allowing the elephants to participate in their own healthcare) and expansive space for enrichment activities. Indoor enrichment items include hay-filled barrels that zookeepers are able to hang from the ceiling which allow the elephants to exercise their trunk muscles, reaching up to these high-hanging devices. Elephants in the wild would behave similarly, reaching high into the tree canopies, extending their trunks for branches and leaves to eat. Elephant watering hole (pool), shade structures in background and center of habitat. The 1.6-acre outdoor habitat (which alone is 4 times greater in size than the entire former Elephant Exhibit) features a watering hole, able to accommodate three fully-submerged elephants, feeding and enrichment walls, shade structures and even a self-activating shower. A demonstration pavilion with shaded visitor seating allows an up-close look at how keepers work with the elephants to offer the highest level of care through daily training and interactions. Through interpretive graphics and interactives, the exhibit depicts “A Day in the Life of an Elephant,” highlighting daily routines for elephants living in human care and elephants living in the wild. It’s the Zoo’s hope that visitors see the overriding goal was to make this entire habitat, both indoor and out, the most normal as possible for elephant behavior in a zoo setting, while also addressing the physical, social and psychological needs of the animals. Elephant Care Center in background, enrichment wall next to the Care Center and feeding wall in foreground. The new exhibit meets the Association of Zoo and Aquariums’ (AZA) standards for elephant care and can accommodate up to five elephants, including bull (male) elephants. 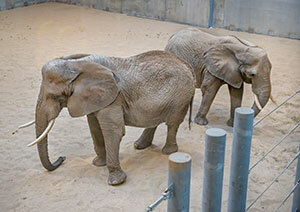 The Zoo will keep current elephants, Ruth and Brittany, and investigate options for additional elephants to bring in. The $16.6 million Elephant Exhibit and the complementing mixed species exhibits were made possible with half of the funds coming from the Zoological Society of Milwaukee, and the remaining half funded by Milwaukee County. Partially heated outdoor patio area for elephants; outdoor habitat in the foreground. The Zoo anticipates that the Elephant Exhibit will draw new visitors to the area; the next closest accredited zoo exhibiting elephants is currently the Indianapolis Zoo. The Zoo’s subsequent projects for Adventure Africa (part of the Zoo’s current masterplan), continue with changes to the existing Hippo and Rhino Exhibits slated to open in 2020-2023. For more information on the new Elephant Exhibit, please contact the Zoo’s Marketing and Communications Department at 414.256.5466. The Milwaukee County Zoo has been continuously accredited by AZA since 1976. Less than 10% of animal exhibitors registered with USDA have achieved AZA-accreditation status.